Sending their son Peter '11 to Seattle Prep was an easy decision for Jack and Ann Christiansen. Both were raised with a when (not if) you go to college mentality. "Education is the basis of everything. We wanted Peter to be well-rounded, to know there is a larger world out there," said Ann. "You're a piece of a larger puzzle." As an only child, and the only member of his St. John's class to attend Prep, Peter stepped a little out of his comfort zone, but Prep's reputation for academics matched the emphasis his parents on education. "My parents always stressed education. It's a privilege, not a right. They taught me to work for it - and work hard - because it was such a great opportunity. Looking back on it now, I'm very grateful," said Peter. "It was super well-rounded in athletics, academics and socially. I'm just thankful to be a Panther!" Prep also reinforced the family's value of volunteerism and their Christian faith. The family culture at Prep was equally attractive. Even before Peter arrived, connections to the Prep community became evident. Family friends and Prep alumni, Kris Bundy '79 and Michele Thornquist '81, wrote letters of recommendation for Peter's application. Jack's friends and sailing buddies told stories of rumbles in the Arboretum after the O'Dea football games. "It almost seemed like the rumbles were just as important, if not more so, than the games themselves," Jack recalled. These conversations helped Peter start to realize how big, and how small, the world really is. He was joining a larger community. "Even now, when I'm out in a Prep shirt or hat, people will approach me and start telling me their Prep experiences." Peter recently played cards with Spencer Hawes '06. The two never crossed paths at Prep, but a lacrosse buddy of Peter's created the connection. At Prep, Peter joined the football and lacrosse teams, serving as the lacrosse captain his senior year. Kairos was another highlight. It made such an impact that Peter volunteered to be a leader his senior year. Dr. Beyer nurtured another of Peter's passions: singing. "Choir was awesome! I always enjoyed singing, and I had never done choir before, but Mr. Beyer is the man and made it so much fun." Peter's gratitude is one reason he donates to his class endowment every year. "My parents blessed me with a great high school education which prepared me to go to college. That is something not everyone gets to do. If I can give someone that else chance to get ahead in life and thank my parents at the same time? It's such a small sacrifice to give such a great gift." Jack and Ann's gratitude for Peter's experience at Prep is the reason they decided to leave a bequest in their estate to the Class of 2011 Endowment. 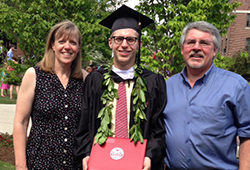 "Prep gave Peter such a boost and head start in education and life," Jack said. Ann remembers writing the tuition checks every month. "It was tight, but I knew it was totally worth it. Both Seattle Prep and St. John's were worthwhile investments. Peter's college scholarships more than covered what we paid at Prep." "We all want the best for our children," Ann added. "I feel for people who want that experience for their child and can't make it happen. Education is the basis for everything; it's never wasted." We think of it as a life plan -- this is what we've done so far and where we are. Our estate plans are a guide to help those who are important to us. We're choosing to do it this way and it's good. You try to plan so many other things in life, so why not plan a little now, so that the produce of your life is shared with the people you want, in the way you want." Peter completely supports his parents' decision. "I think it's a great way to continue their legacy, and reach out to help people when they're gone. You can't get back, unless you give first."